Several books I've read in the past have encouraged me to make meal times special on a regular basis. While I don't pull out the china since my girls are still too young for that (and I don't even own any china), I try to find unique ways to show my family that they are thought of while I am preparing meals for them. 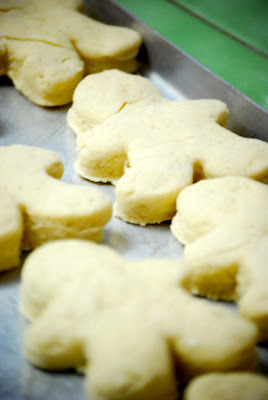 Here's a quick idea that will get those extra miles out of your cookie cutters - use them as biscuit cutters! Do you have other ideas for how to make everyday meals special, not just on Christmas Day? aww love that idea! I too need to work on making meals more special! Did the book have any suggestions on how to do that? What book was it? That's a great idea, Ashley! Lindsay - several books have given this encouragement. Noel Piper's Cherishing God in Our Traditions and another book by a different author called Family Fragrance are the two that come to my mind.